I need two wallets. I wish I could say it was because the existing one can’t contain all the bulging wads of cash that I’m constantly stuffing into it, but sadly that’s not the case. No, the conundrum with my wallet really has nothing to do with money at all. Not in the conventional sense anyway, although I’m sure most of what’s troubling me is intended to either encourage me to part with my hard-earned cash, or to at least accompany me in the act of doing so. I was walking past a bedding retailer the other day – can’t remember which one, might’ve been Capt’n Snooze (I think the “Capt’n” bit’s been retired), though I could be wrong. Anyway, whichever one it was had positioned a disproportionately large sign in the doorway, extolling the virtues of their new “customer loyalty program” to anyone within a 3km radius. What was on offer was no less than I’ve come to expect from these programs – discounts on in-store and online purchases, discounted delivery and my very own customer loyalty program card! Seriously? Another loyalty card? The last thing I need is another effing card cluttering up my already-in-need-of-an-overflow-wallet wallet! Who needs a loyalty card for a bed shop anyway? I mean, how often can the average person realistically shop for bedroom furniture and associated paraphernalia? I would’ve thought there’s only so many beds, wardrobes, tallboys and bedside tables the average house can sustain – and, for that matter, only so many bedroom upgrades the average budget can sustain! What real ongoing value could this loyalty program offer me? a smash repairs card – really hoping I won’t need that again! Count them – 27 cards! And you just keep them in there on the off-chance that you ever end up somewhere you can actually use one of them, don’t you? Who wants to miss out on those massive customer loyalty bonus discount thingies? In truth, most of the cards are utterly useless anywhere other than the outlet where you were so deftly convinced to sign up to the program. Whenever I go overseas I take practically all of them out of my wallet, pop them into a little zip-lock plastic bag and drop them in a drawer. Presumably I do this for safe-keeping, though I’ve never quite decided what I think will happen to them if I don’t. And more often than not, when I come home most never find their way back into my wallet again. My life is none the poorer for this outcome, though I do have several drawers full of useless cards. I’ve always been something of a hoarder. My wallet tends to accumulate crap without me even noticing. Alongside my twenty-seven cards I’ve just now discovered sixteen receipts (none of which I needed to retain for any reason), six ATM withdrawal slips (equally purposeless), an invoice for two cases of wine I bought and subsequently had delivered almost four months ago (so yet again, no need for the invoice to still be there) and a two-year-old electronic payment record from the only meal I’ve ever paid $400 for – I’ll probably keep that one for posterity. And sitting there quietly amidst this chaotic mess of cards and assorted rubbish – four actual pieces of cash money, taking up less wallet space than anything else. But it’s 2012 – why can’t I just have one card for everything?! Well funnily enough, we almost did. 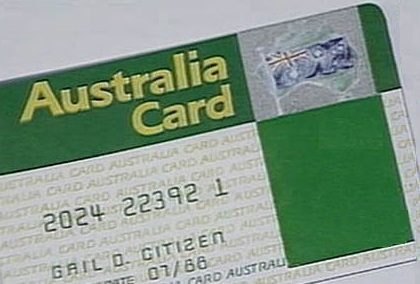 The Australia of 2012 is a far cry from that of 1985, which is when the first “Australia Card Bill” was presented to – and rejected by – the Senate. Twice. Today we have innumerable options for making purchases, ordering goods, making reservations, registering for stuff, opening accounts, applying for credit cards and bank loans, making and monitoring transactions, tracking our location and suchlike, all of which makes the public and political reaction twenty-seven years ago to the proposed ‘Australia Card’ slightly comical. Hmmm… identification systems, data surveillance, powerful location systems… spooky stuff back in 1987. Funny how no one thinks twice about using the internet, social media or GPS in 2012. The article also suggested that “Every person in Australia will be required to obtain a Card, including children. The Bill does not make it legally compulsory: it simply makes it impossible for anyone to exist in Australian society without it, because they will be unable to carry out normal activities such as the receipt of their pay taxed at the normal rate, operation of bank accounts, or the receipt of social security or health insurance benefits.” So the Bill would’ve made it impossible for anyone to exist in Australian society without the card – oh the melodrama! All at the same time it sounded so exciting, so cloak-and-dagger, so very futuristic and just a little bit spooky. To be fair, I guess the reaction was very ‘of its time’. The Cold War was still a going concern, everyone everywhere was still obsessed with the whole east/west thing and the notion of secret agents and spies was still very much topical. Is it any wonder Aussies were only concerned about everyone knowing too much about everyone else’s business? Still, the whole idea of this inoffensive little card triggered a reaction that bordered on a science fiction-style panic. Comparisons were drawn against George Orwell’s “1984”, with its concept of a future where ‘big brother is watching’ and Australians the nation over were, quite literally, afraid of what this special Bicentennial gift might mean for them. Was it mere coincidence that the Privacy Act was also introduced in 1988? At any rate, we clearly didn’t know the inconvenience we were enslaving ourselves to. Today, we’re already centralising significant chunks of our lives to handheld electronic devices which, to all intents and purposes, have started allowing us to do precisely what everyone was so afraid of twenty-five years ago. But we still need to get rid of all these cards! It’s not as if we’d be the first ones either. Citizens of countries all over the EU have cards used for the purposes of general identification, when travelling, for health insurance, all kinds of things. It really isn’t that scary any more. And it’d be so convenient. I wish someone had’ve shown a bit of foresight back in 1987. At the rate these initiatives typically move – particularly Government initiatives – even if it was agreed tomorrow I’d still be dead and buried before it ever got off the ground! 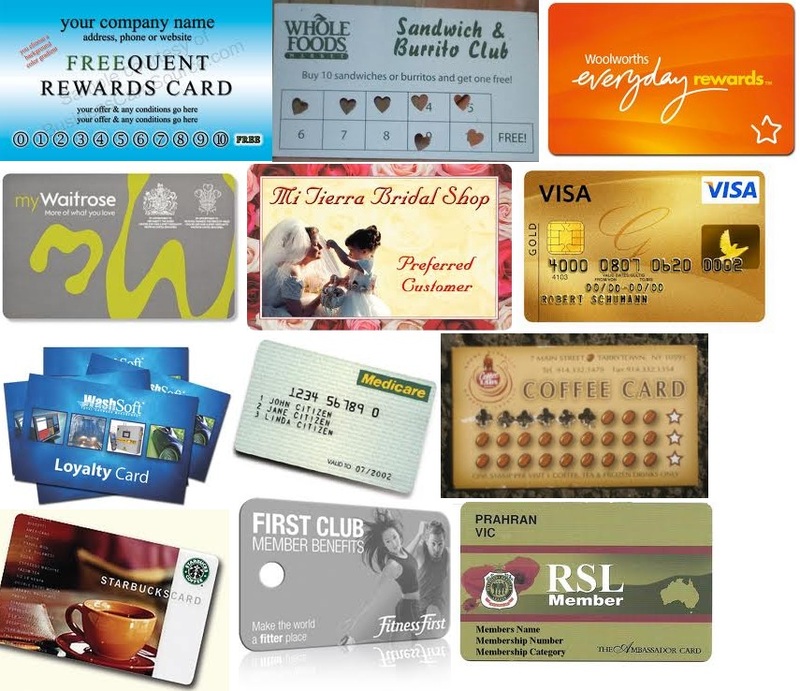 This entry was tagged customer loyalty program, discount card, loyalty card, loyalty discount, store card, The Australia Card. Bookmark the permalink. ← THE AMERICAN WAY: if it moves, shoot it? Well thank you very much, I’m really glad to know you’ve enjoyed what you’ve seen.